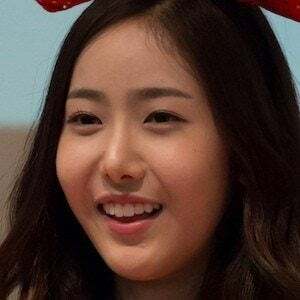 Known otherwise as SinB, she is one member of the six piece girl group GFriend. The burgeoning K-pop group made their debut in 2015 and has since released several EPs including Season of Glass and Snowflake. She studied at Seoul School of Performing Arts. Before settling on becoming a singer, she originally wanted to become an international lawyer. On the original soundtrack for The Fairies In My Arms, she performed three solo singles, "I'll Be There," "The Fairies in My Arms" and "Sha-wing's Song." She has often been compared with Girls' Generation's Jessica Jung for their similar appearance.